Custom 4x4 Firefighter Edition Decal Kits from Weston Ink. Make your personal vehicle or grass rig unique with these full color graphics. 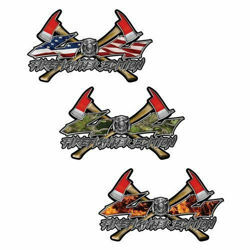 We have the largest selection of 4x4 graphic decals for your truck, suv, atv, side by side off road or street machine. Designed and produced in house using the the best materials and newest processes available. Using the newest printing technology with a 7 color process these graphics pop in color and are highly detailed. New inks also extend the life of the graphic for years to come without any fading.